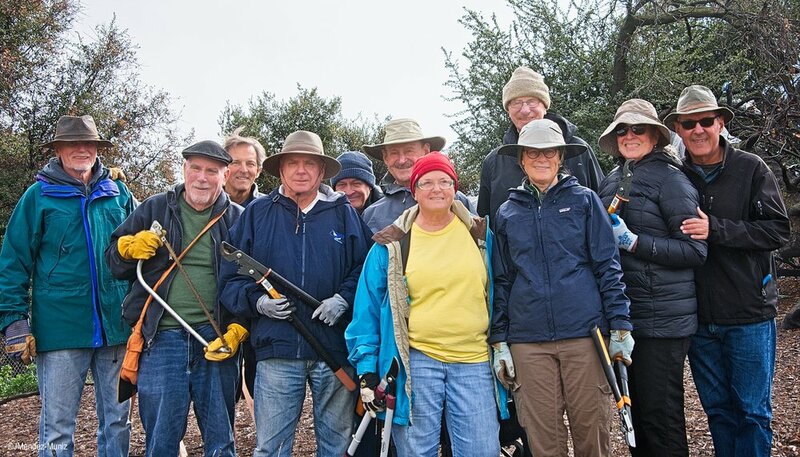 THE GREAT DHUNI STICK HARVEST volunteers at Meher Mount on January 12, 2019. (Left to right) Jim Whedon, David Trombley, Kyle Morrisson, Jim Whitson, David Springhorn, Sam Ervin, Cassandra Bramucci, Fred Stankus, Kristina Somma, Agnes Montano, and Juan Mendez. Margaret Magnus is taking the photo, and Robert Turnage is at the Visitor Center greeting guests. Lisa Morrison, Kristen Tarpey, and Mike Tarpey came later in the afternoon. The 1,200 sticks from Baba’s Tree are destined for 30 other Meher Baba groups for their dhuni fires. The dhuni “symbolizes the fire of Baba’s divine love,” explained Meher Baba’s close disciple, Eruch Jessawala. The piece of wood represents some attachment or desire that an individual wises to burn to ashes. Meher Mount is sharing these small pieces of wood from this place of pilgrimage, sanctified by His Presence, with those whose hearts are aligned toward Him. For those who cannot come to Meher Baba’s mountain, these dhuni sticks are a way to bring a bit of Meher Mount to them. Baba’s Tree is the Coast Live Oak under which Meher Baba sat on August 2, 1956. Meher Mount co-founder Agnes Baron began calling it “Baba’s Tree” when she, Jean Adriel and the New Life Foundation board first came to the property in 1946. During His visit, Meher Baba sat alone under the tree, accepting it as His by His actions. Baba’s Tree has been burned by fire – twice. The first time was on October 14, 1985, in what Meher Mount calls the New Life Fire, and the second time on December 4, 2017 in the Thomas Fire. In the Thomas Fire, high winds toppled the canopy and fire burned the trunk and limbs of the tree. There is an ongoing program to nurture Baba’s Tree and its regeneration. The dhuni sticks are part of that fallen canopy. It seems fitting that each of these sticks is a gift from Meher Baba and from His tree through His fire and returning to His fire. After all the dhuni and walking sticks are harvested, the remaining twigs and branches will be be chipped and used for mulch around Baba’s Tree to hold in moisture and provide nutrients. During the harvest, Ventura County Star reporter Claudia Boyd-Barrett came by to take photographs, learn more about the dhuni, and get an update on Baba’s Tree progress. Earlier, she had written several articles on Baba’s Tree (“Baba’s Tree, burned in Thomas Fire, fights for survival in Ojai” and “Damaged in Thomas Fire, Baba’s Tree Limbs Live on as Benches at Ojai’s Meher Mount”). After the sticks were harvested, they were baked in the oven for six hours at 200 degrees to remove any pests as part of the conservation effort to prevent the transportation of insects. When The Great Dhuni Stick Harvest was planned, little notice was taken of the actual date of the volunteer weekend. It was only later that the team realized that the harvest would take place on the 12th of month. In December 1941, Meher Baba instructed that a dhuni should be lit on every 12th of the month in Meherabad, India. That tradition continues today. Other groups also light a dhuni on the 12th of the month or have a dhuni at special gatherings. Thus, it was only fitting that after the dhuni sticks were harvested, there should be a dhuni at Meher Mount. The rainy weather greatly reduced the risk of a wildfire, and cautions were taken to use the metal charcoal pan of a BBQ for the fire. Each person at Meher Mount that day had an opportunity to participate in a dhuni — many for the first time. Dhuni day January 12, 2019, was a special day, and many people were touched by the experience. “I’m still drenched with His Love and bliss experienced at Meher Mount in the spontaneous outpouring of rain and brothers and sisters in harmony with the great fortune of piecing His sacred tree that contains His Presence!” wrote Fred Stankus several days later. For several of the dhuni harvesters, this was their first visit to Meher Mount. “Thank you for the warm welcome. I am looking forward to seeing you all again. It is humbling to see the way He is reflected from you folks,” said David Trombley. He felt that entire experience had opened his heart. After the dhuni, the plan had been to go to a local restaurant after the harvest on Saturday. Fortunately, they were so busy the restaurant couldn’t take a group of 12. Instead, the group ordered take out, set up tables in the Visitor Center, and thoroughly reveled in the afterglow of a one-of-a-kind dhuni day at Meher Mount.